Not all powder is created equal. Some is thick, heavy and “surfy”. Some is light, fluffy, and produces blinding faceshots with every turn. And there’s plenty of room in between. What controls the type of powder that we ski, and is there such a thing as a perfect snowflake? To investigate, let’s first review how snow is created. The easiest way to think about meteorology is that all weather requires both moisture and lift. Without either of these two ingredients, there would be no precipitation. The combination of moisture and lift is responsible for hurricanes, tornadoes, thunderstorms and yes, snow. More specifically, snow is created by converting moisture into snowflakes. Water vapor is actually invisible, and it is all around us. Most fluffy-looking clouds are made of tiny liquid water drops while high, thin clouds are made of tiny ice crystals. For snow to form, water vapor and the tiny liquid water droplets in clouds are converted into snowflakes, and then these snowflakes fall to the ground. It’s obvious that moisture is a necessary ingredient for this process, but why is lift important? Because rising air expands since pressure decreases as you move up into the sky and away from the ground. Expanding air cools, and this cooling helps to condense the water vapor into liquid water drops and into snow flakes. This background explains how snowflakes are made, but it doesn’t explain why there are different types of snowflakes and how they create different types of powder. For that, we need to get more specific. 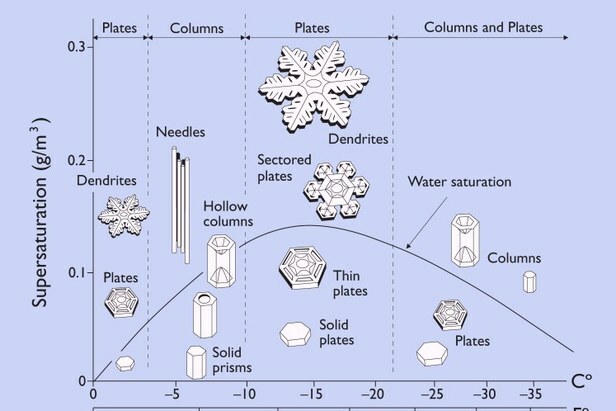 Based on the snowflake diagram, different combinations of temperature and moisture produce different types of snowflakes. Heavier, thicker powder is often produced by dendrites formed in warmer temperatures between about 26 and 32 Degrees Fahrenheit with a good amount of moisture in the air (moisture is shown by the y-axis, or left axis). When temperatures are very, very cold, the relatively little bit of moisture in the air tends to produce small plates or columns (right side of the image). You’ll recognize these snowflakes in real life as tiny specs that accumulate very, very slowly. In between this range is the beautiful, large, stellar dendrite produced with the combination of plentiful moisture and temperatures between about 0 and 10 Degrees Fahrenheit. This is the big snowflake at the top of graph. Because these snowflakes are “perfectly” shaped with six points, they tend to stack on top of each other instead of packing tightly together. Stacked snowflakes ensure that the new snow is mostly made up of air pockets, and this is what creates the perfect snow conditions with light, ‘blower’ powder. To find this type of blower powder, you’ll want temperatures of 0 to 10 Degrees Fahrenheit just above the mountain top in the cloud layer that produces most of the snow. If this cloud is also extremely moist (there can actually be more than 100 percent relative humidity… but that’s for another post), beautiful dendrites will fall from the sky and skiers and riders will be in powder heaven.